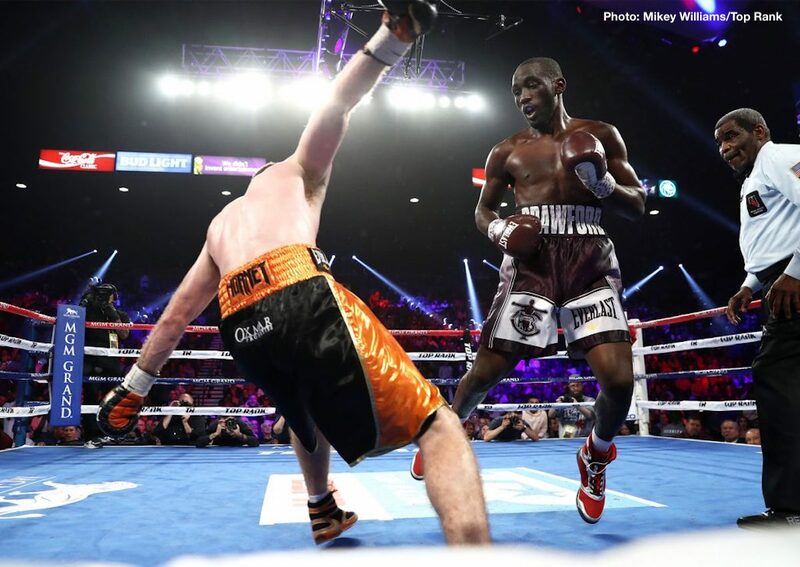 Last night may well have been just the beginning, the start of the supremely talented Terence Crawford’s dominance at welterweight, the third weight-class at which the unbeaten pound-for-pounder has won a world title. Jeff Horn, who Crawford systematically broke down and outclassed in just under 30-minutes of fighting, may have been the so-called weak link when it came to the current 147 pound champions – and there were not too many people picking the tough Australian to hold onto his belt against the clever, switch-hitting Crawford – but the win has to be respected and taken note of all the same. Is this just the beginning of Crawford’s take over at 147? There are a number of fine fighters currently operating at the weight greats such as Sugar Ray Robinson, Henry Armstrong and Floyd Mayweather helped make glamorous, and Crawford’s greatness promises to be mined in fantastically entertaining battles with the likes of Keith Thurman (if and when “One Time” returns to his best), the Shawn Porter-Danny Garcia winner and, the biggest threat to Crawford surely, Errol Spence. The heart jumps a beat at the thought of two of the sports’ fastest and finest boxing brains – Crawford’s and Spence’s – duking it out. For the seemingly otherworldly Vasyl Lomachenko aside, these two are almost certainly the very best boxing has to offer these days. In an age where the best facing the best rarely happens, these two not-yet-superstars (maybe never to become such, but by fighting each other on a grand stage the winner’s chances will be greatly increased) seem intent on finding out just who is the superior athlete, boxer, fighter, warrior. Both Crawford and Spence have the ability to excite the masses in a punchout as much as they can execute a chessmatch that delights the purists, and we could well be treated to a classic showdown when these two modern day masters collide. The fight has to happen and, refreshingly, both champions, both of them still recently crowned, understand and respect this. Maybe, if we’re really lucky, these two in-their-prime fighters will give us and their sport the next great trilogy. As special as they both are, it would likely take more than one fight for all their respective genius to be revealed. Previous boxing news: What, who next for Tyson Fury?